All you need for enjoying and relaxing in the nature. 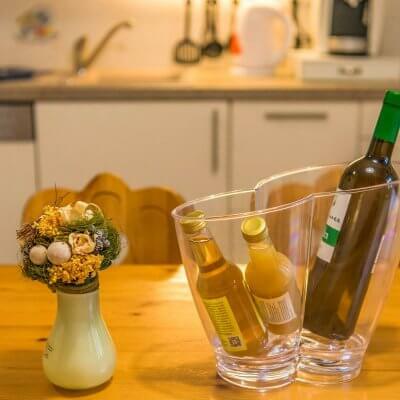 Mrakič Apartments are situated in an old, traditional Bovec house, in the peaceful part of this lovely, with nature surrounded town. All of out apartments are equipped with everything that guest on an active vacation needs for relaxing time off in the nature. You can choose from four different apartments; Emerald Drop, Active Rest, Forest Stroll and Wild Descent, each of them unique on its own, so the guests can experience unforgettable active vacation in the nature. Apartment Emerald Drop is our newest and most modern apartment, completly renovated and re-equiped in 2013. With modern aproaches we were able to create private, initimate atmosphere, which is most noticeable in coexistence of bedroom and bathroom. Apartment Wild Descent is our most booked apartment and it is located on the top floor. 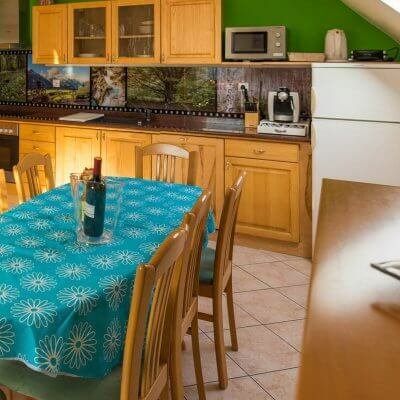 Apartment is ideal for families and groups between 4 to 6 people. Apartment Forest Stroll is located on the top floor and offers relaxing view on the surrounding hills and mountains. Apartment Active Rest was out first apartment available for rent. 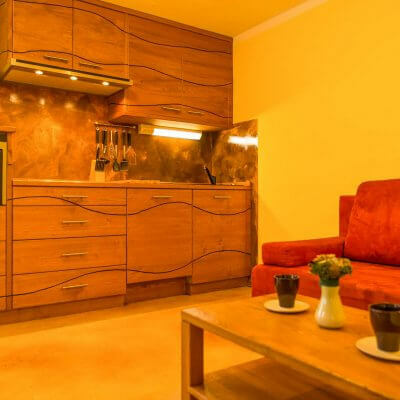 It is located on the ground floor and with bathroom attached to each room it offers the home alike luxury.